Botswana | Where is Yvette? 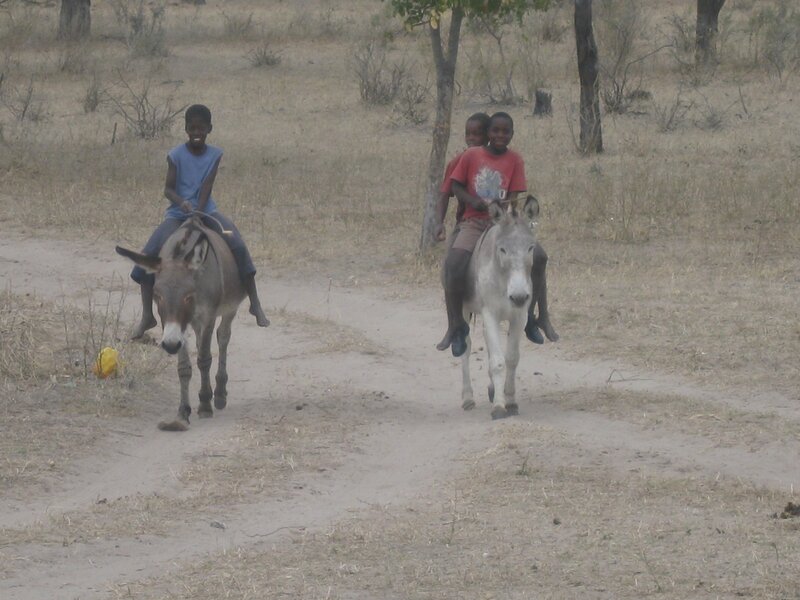 Botswana is a lovely country with amazing scenery and people not found elsewhere. They are also sort of famous in Africa for being the most politically stable country since independence (a multi-party system with no vote rigging and a free press is unheard of anywhere else), so it’s always nice to support the places that get it right. 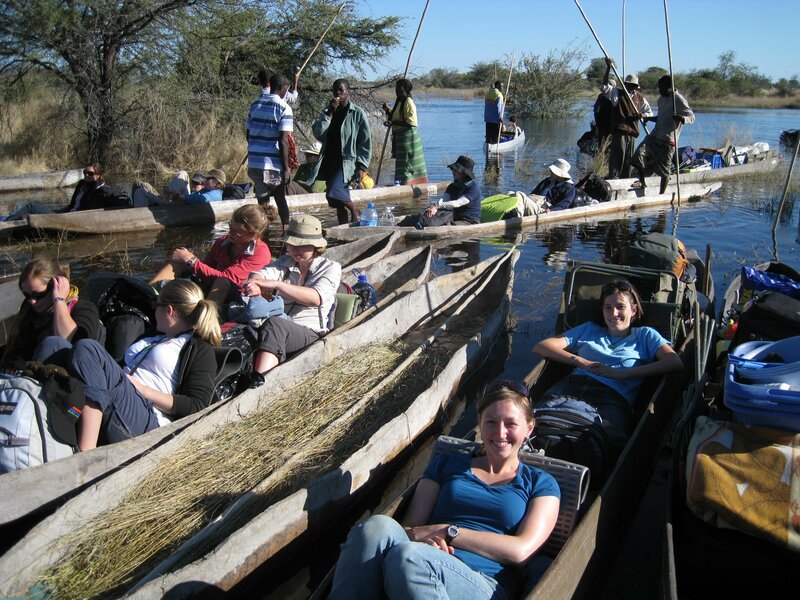 – I am in love with the Okavango Delta and consider it to be one of the true highlights of my entire trip. Just an amazing place completely unlike one you will find anywhere else on Earth. Plus the campfire night where we got an odd mix of local African music and some of our own tunes going was simply magical. – Also, do yourself a favor and fork over the extra dollars for a flight over the Delta so long as you’re there. 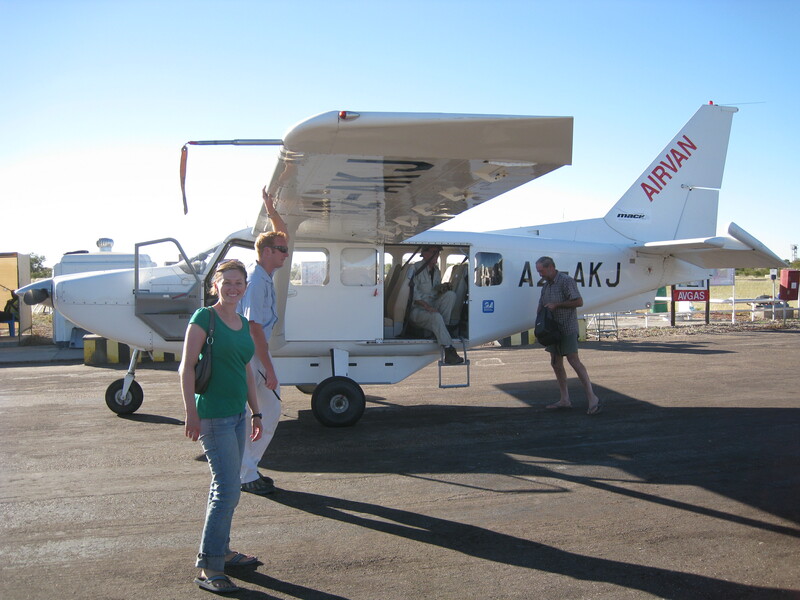 You won’t regret appreciating the scale and doing a safari by air, I promise you! – I saw a male lion in Chobe National Park as well as so many elephants that I got sick of them. Plus there was luxury camping meaning I didn’t have to do food prep or anything! Sweet. – As a fun little detail, my sister and I were very impressed that when we wanted a plastic bag to carry our grocery purchases in Maun they charged us the equivalent of ten cents for the bag. There is something very interesting about a nation considered third world which is more environmentally friendly than your own. – I got bit by mosquitoes in the Delta, the only place in a malarial zone where such a thing happened (we were careful and took pills regularly and bathed in repellant, but mosquitoes seem to think my blood is tastier than candy). This is annoying because if I ever develop flu-like symptoms the next year I need to get tested for parasites living in my bloodstream, which is a titillating prospect I must say. As a complete aside however one of the world’s best malaria study centers is at CWRU, so I’m sure those researchers would be totally psyched. 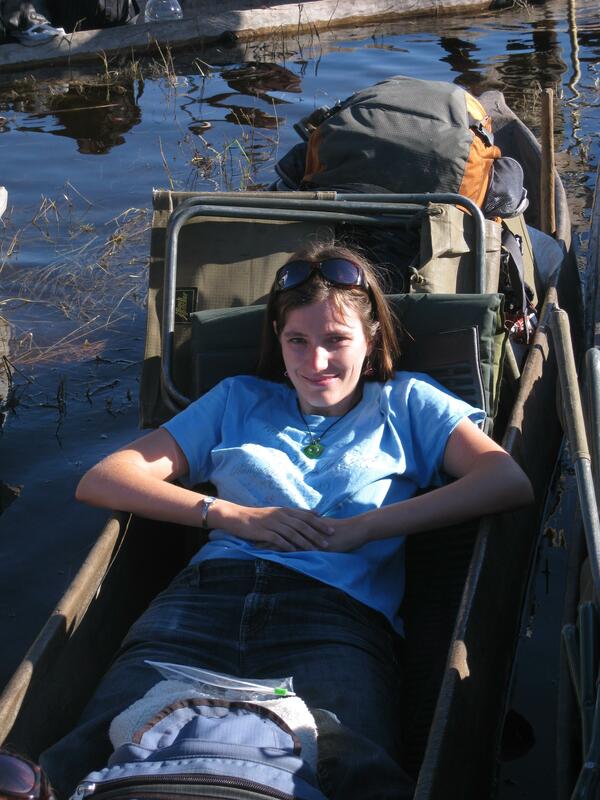 – It is unfortunate to mention that the one time someone tried to cheat me during my entire trip (in a very real sense, not a “trying to see if I can get away with an overinflated price” sense) was in Botswana, at the Maun Campground. My sister and I decided to upgrade to really nice digs after the Delta which were rather expensive for Africa, which were lovely until a fire started on the electrical pole beside our bungalow. Oh lovely… anyway, fire was put out but we were obviously without power or hot water, and instead of offering any refund on this the campground waited until very late at night to offer us $5 off a $60 room or the full refund if we wanted to set up our tent at that godforsaken hour. Somehow we weren’t particularly touched by this offer so we put up at tent that night on principle. As I said, this is the only time I felt in any country that someone was not going out of their way to be nice to the customer, probably because this campground has a bit of a monopoly in Maun for people who want to go out to the Delta. – Last, there is an odd little ritual in Botswana whereby every 100 km or so there is a checkpoint and everyone needs to walk through disinfectant with their shoes. This is ostensibly to curb the spread of foot and mouth disease but seeing as there have been no cases in this part of the world for years it’s really more a remnant of government bureaucracy they haven’t managed to be rid of. What really annoyed me was how one day we went through these checkpoints around lunchtime, and they checked our coolers and discovered we had salami. Technically you’re not supposed to carry meat through the checkpoints but the real reason the salami was unearthed is because the guards were hungry and wanted to confiscate it, but in order to screw them our cook and driver ate the stuff quickly rather than hand it over. Thus later at lunch that day there was a salami shortage, which is a great tragedy when the only other meat you can get in that part of the world is spam mystery meat a finicky eater such as myself won’t touch. Funny the things that really upset you in hindsight. Cheers! Chobe National Park is the big game park in Botswa, just a stone’s throw from where Botswana, Namibia, Zambia, and Zimbabwe come together. We spent a night there but I think more people as excited about the digs that night as they were about seeing animals, as we were billed for a night of “luxury camping.” What does that mean, you ask? 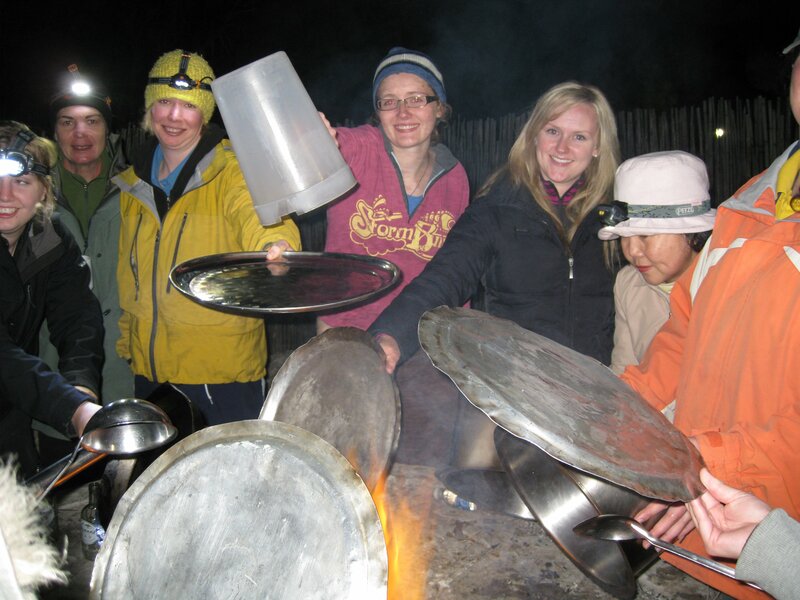 It meant a three-course meal on linen instead of balancing our plastic plates on our knees, a tent tall enough to stand up in instead of crawling around on knees, and a cot instead of the good ol’ sleeping bag. These are the things that excite you after nearly three weeks of camping, believe you me. To begin the safari highlights, here are some giraffes. After many safaris I am convinced that giraffes are my second favorite African animal (you just can’t beat leopards), just because they are the most messed up example of evolution out there. I mean look at that thing drink, it needs to disjoint its shoulders to do it! 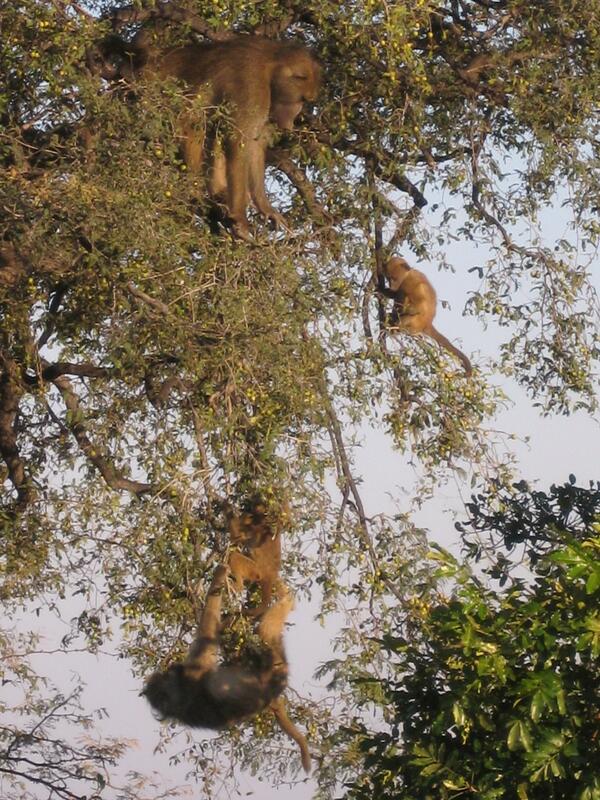 Next, a troop of baboons causing a ruckus in a tree. I was rather amazed by them because they were doing antics that looked just like the Barrel of Monkeys game. The all-important task of grooming. You get to eat all the lice you find, so it’s not a bad deal at all! Here is the fun-filled fact of the day I learned while on safari- a warthog is called an “o’pumba” in these parts. There are no meercats in this part of Africa, so no word on whether they’re called “timone” in any local language! 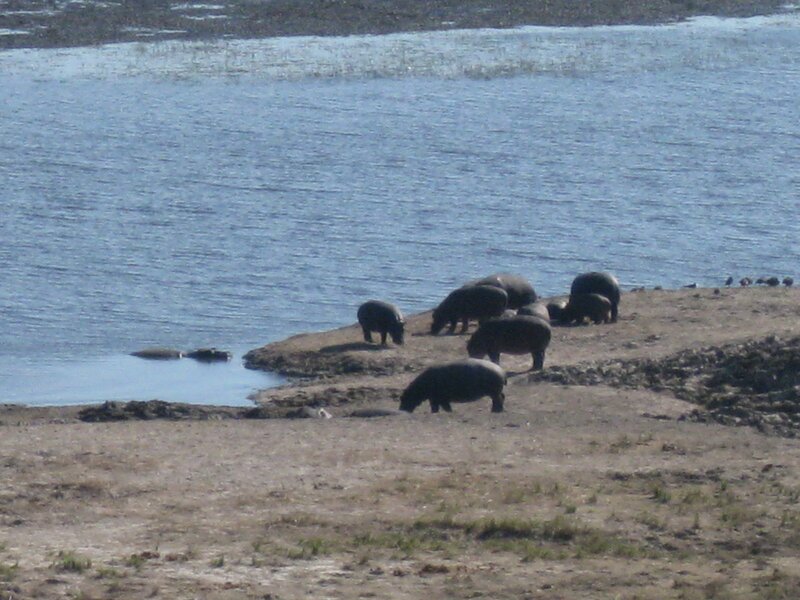 A few hungry, hungry hippos who are the sole inhabitants of this island in the middle of the Chobe River. Interestingly enough this island is one of the more highly contested pieces of property in the world as the Chobe River marks the boundary between Botswana and Namibia. 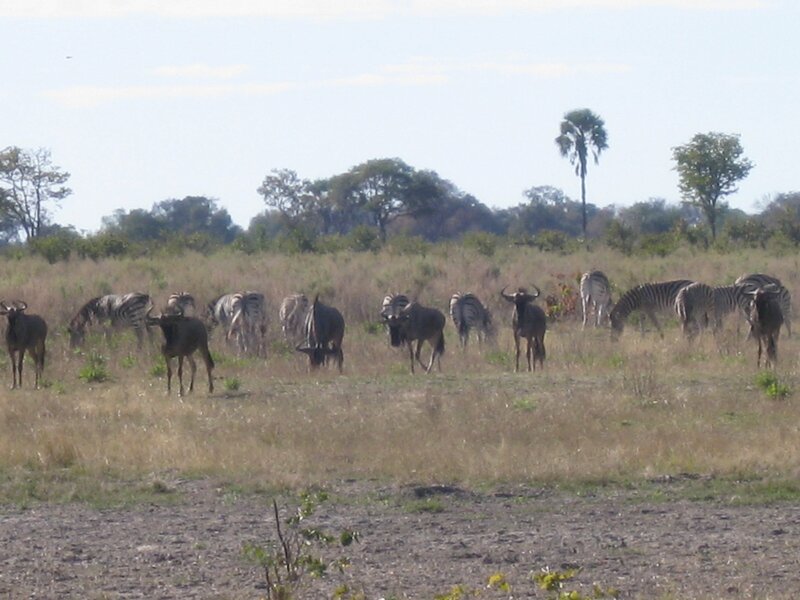 Just a few years ago tensions ran so high in the dispute that it took a ruling in Botswana’s favor by the International Court to settle the dispute! And what did Botswana do with this new found territory? Add it as part of Chobe National Park of course! Seems a little silly really- I don’t think the hippos particularly minded being Namibian or Botswanan. Huh. Did you know male elephants have five legs? Anyway, Chobe National Park is noteworthy because it has an elephant population numbering around 130,000, meaning it has the highest concentration of elephants anywhere in the world. In fact there are about 60,000 elephants too many which pose a serious problem- you can’t cull them because Greenpeace gets really pissed, and you can’t send them to other parks because elephants never forget and come back. Until a solution is found, large swaths of Chobe look like a tornado just passed through due to the destruction caused by too many elephants. 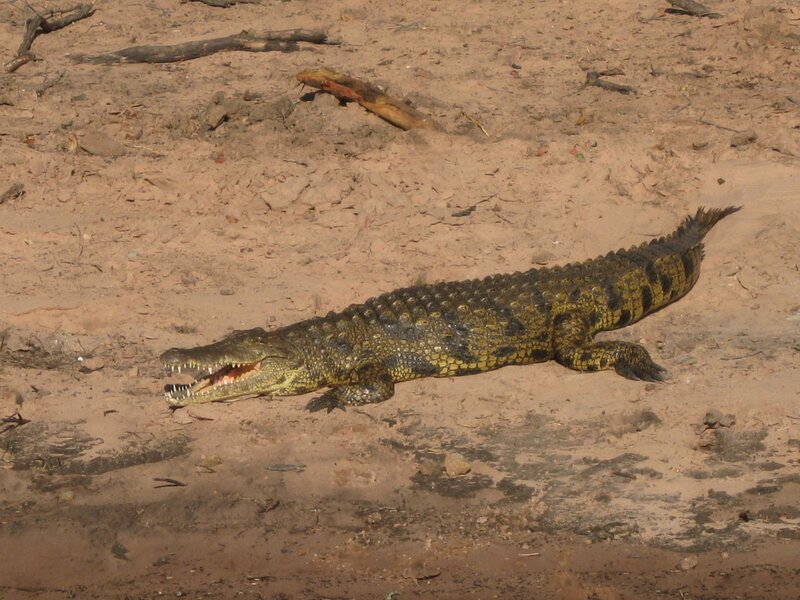 No African river cruise is complete without a few crocodiles, so here is a picture of one looking appropriately evil. To my knowledge, there has never been a sympathetic-looking crocodile found in nature. 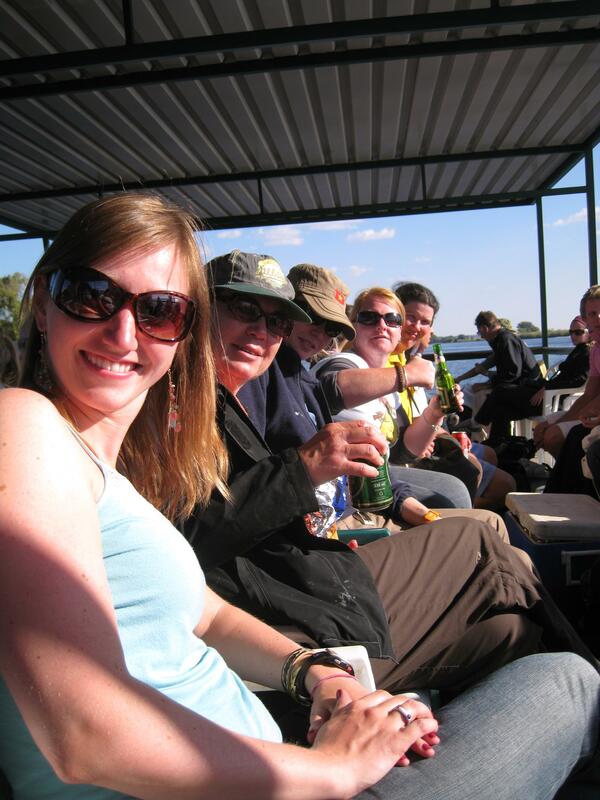 Chobe was my last African safari, which is probably an ok thing because I wouldn’t want to take the risk of going out one too many times and losing the magic of it. But as a final note we did see a male lion just late enough at night so I couldn’t take a picture- who proceeded to roar and mark his territory lest we forget his rule of nature. Pure magic. 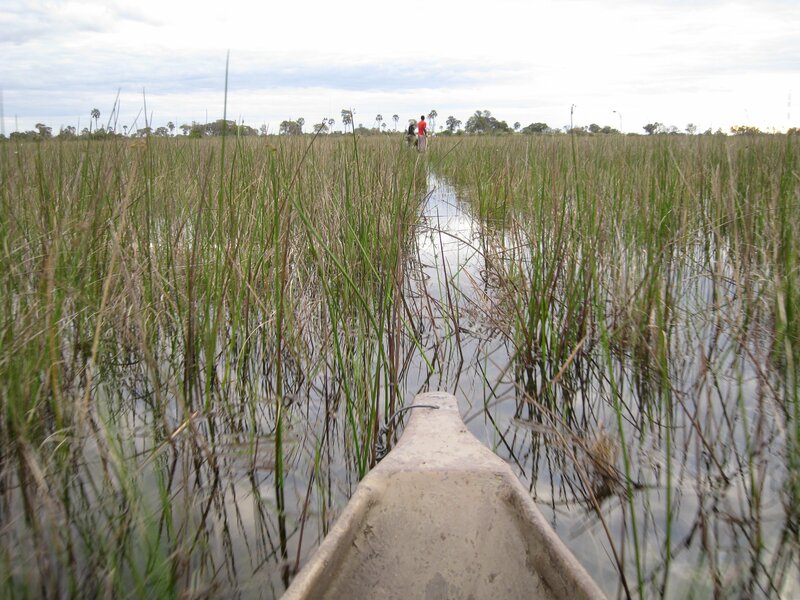 When you’re in the middle of the Okavango Delta, it’s impossible to grasp the scale of it. The place is several thousand square kilometers, meaning we only moved an inch or so on the map above, and the only way to really understand the scale of it is from the air. It was wonderful, absolutely wonderful. We flew at 500 feet or so the whole time and wow, you really cannot imagine the scale of this place until you look to the horizon and all you see is water, islands, and more water for some good measure. 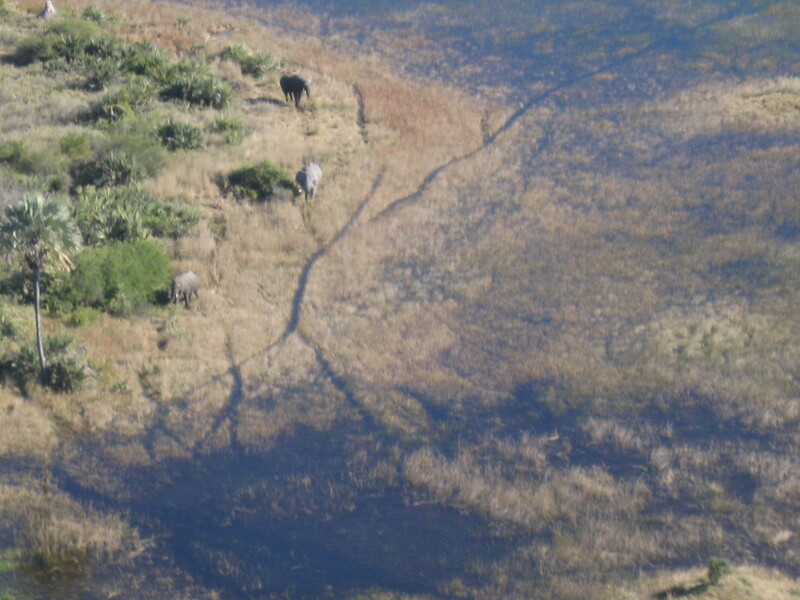 The most exciting part of the Okavango Delta from above, though, is spotting the occasional animals as you go by. Like those grey lumps on the left? Elephants! The countless trails through the reeds are made by animals too, as they travel between the islands. 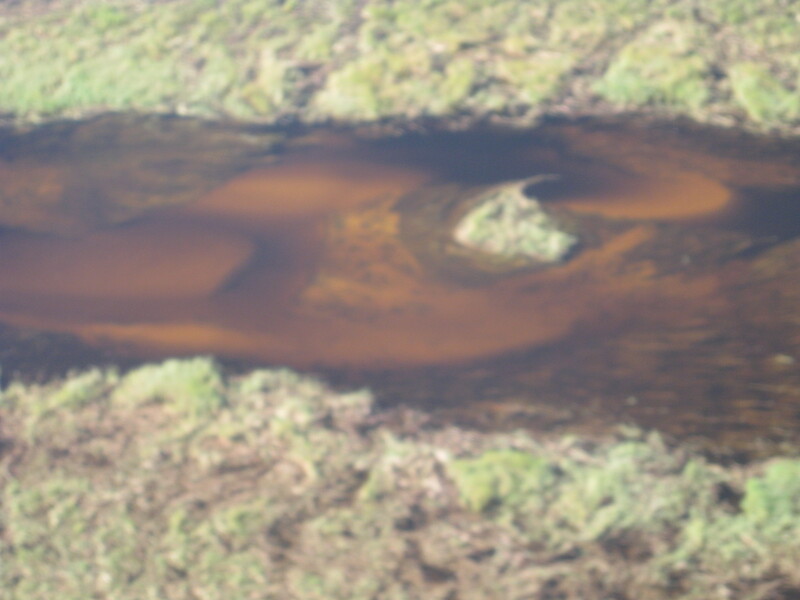 It’s really hard to get a good picture of the animals below from a speeding plane so I opted to not spend much time doing it and enjoy the ride instead, but here’s a picture of water buffalo to give you an idea of what it’s like up there. All too soon it was time to come down to Earth, but I must say this combined with the trip into the Delta the prior two days was one of the true highlights of my trip. It never ceases to amaze me that the world never gets boring even after several months of exploring it- just when you think you might have a grasp on things a world marvel like the Okavango Delta will amaze you with its beauty and uniqueness, and leave you breathless. There are some places that speak to you on the level of their immensity, their beauty, their unique position on our planet, and one of those places for me is the Okavango Delta. 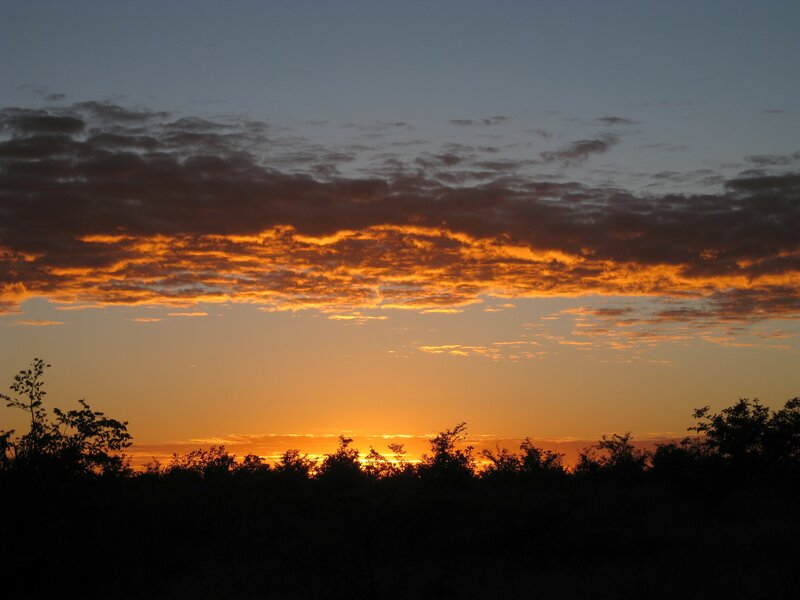 This place is amazing- it is the area where the Okavango River from the Angolan highlands ends in the Kalahari Desert, miles and miles from the ocean, covering 15,000 square kilometers. It’s billed as “the world’s largest inland delta” but frankly any guide will tell you there aren’t really any others upon questioning, and there is really nowhere else quite like it on Earth. So naturally, we had to check it out. 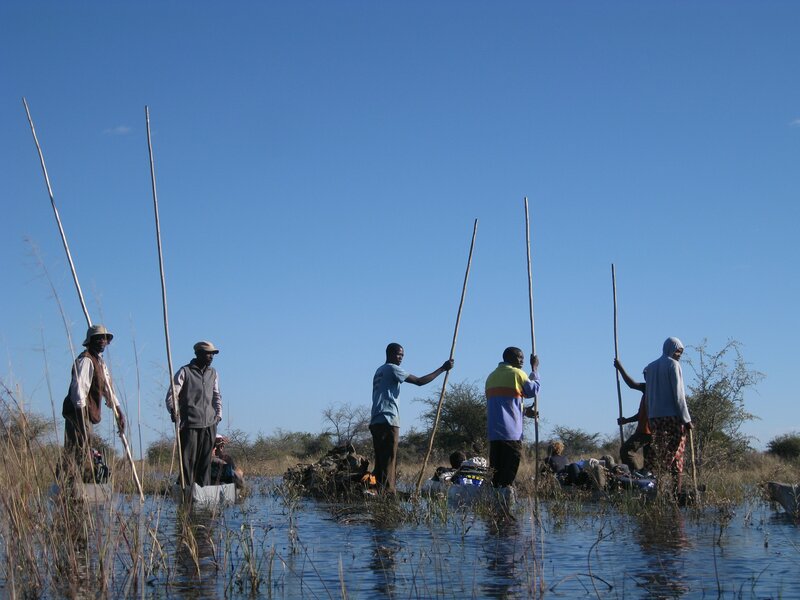 What our group ended up doing was two nights of true bush camping in the Delta, as in the no running water dig a hole kind of camping, on one of the larger islands in the Okavango area. This means we needed to fit everything onto the group mkoros for the journey in and out, and there was lots of chaos at the poling station as we got ready! This year is a record flood in the Delta, the largest flood in 40-odd years!, meaning what was normally a 1.5 hour mkoro ride to our campsite was transformed into a 3-hour odyssey (and, of course, three hours getting back). We definitely felt sorry for the polers by the end of it. 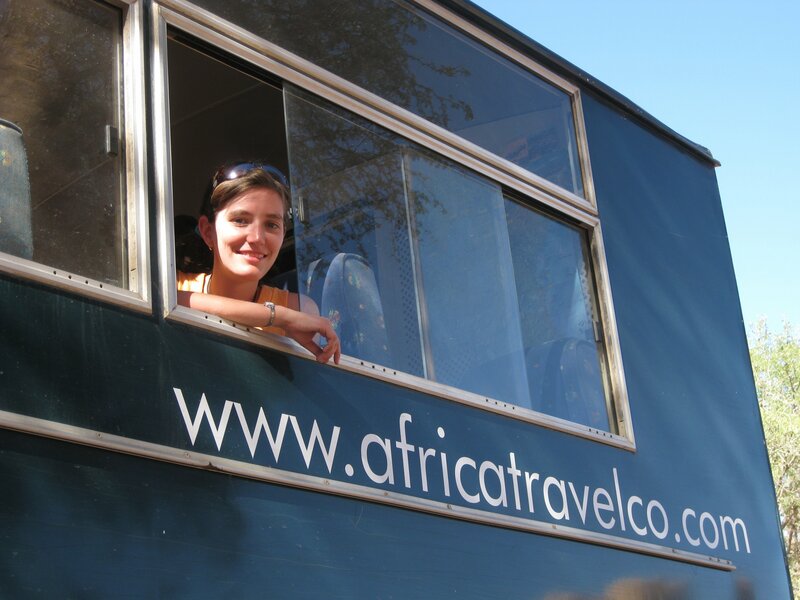 A picture of Ruth, our tour guide for the overland adventure, who was on her nth ride into the Delta. She is hugging her giraffe water bottle which I confess I was insanely jealous of on the entire trip, both for the cuteness factor and the fact that water bottles are awesome. Oh, and just so no one ever accuses me of making Africa sound a lot more rosy than it really is at some times, see those little black specks on my sister’s backpack in this picture? Bugs. 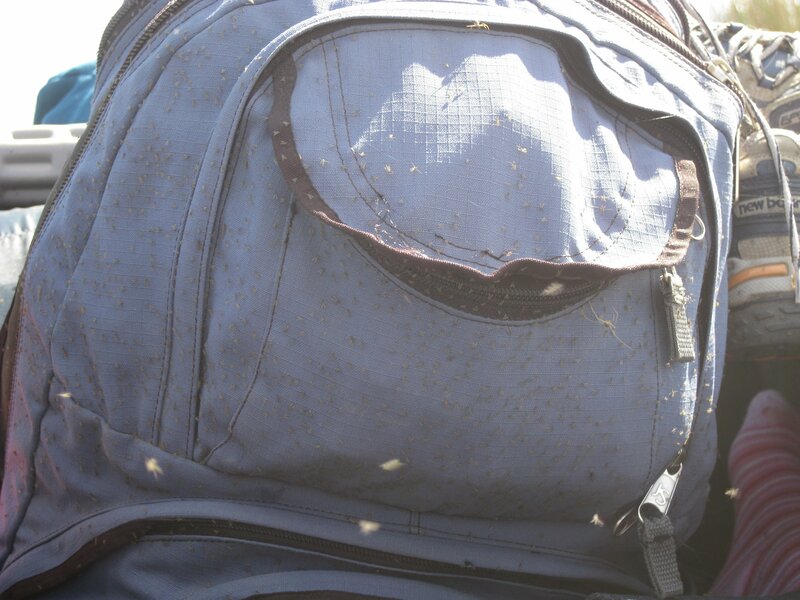 Thousands of thousands of bugs that were hiding in the reeds of the Okavango and attacked our mkoro while we were going, whose only goal in life was to find the most awkward crevice on your person and die there. Don’t come to Africa if you don’t like bugs, ok? I’m the hip-hop-opatamus, my lyrics are bottomless! 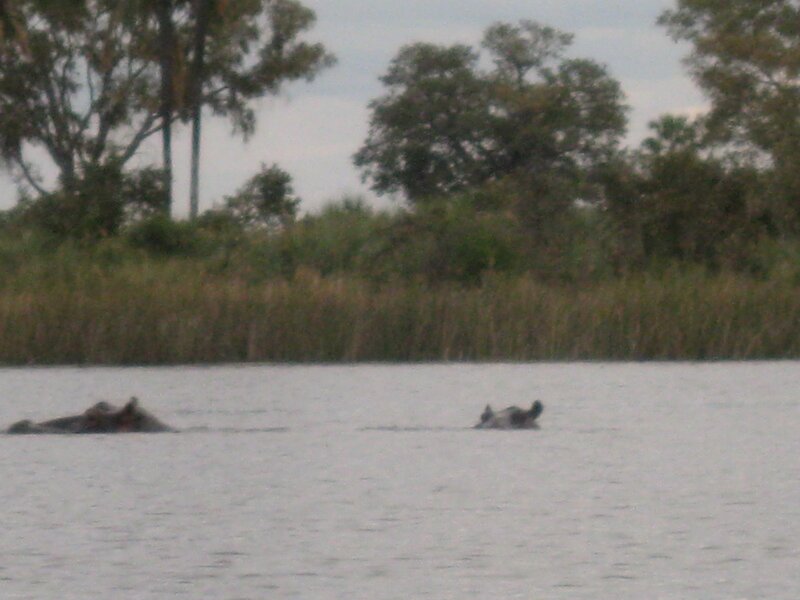 Another cautionary warning to African adventurers- beware the hippo. Most people don’t realize it but they’re the most deadly animals in Africa because they don’t like boats and are known to attack any that come into their pools. 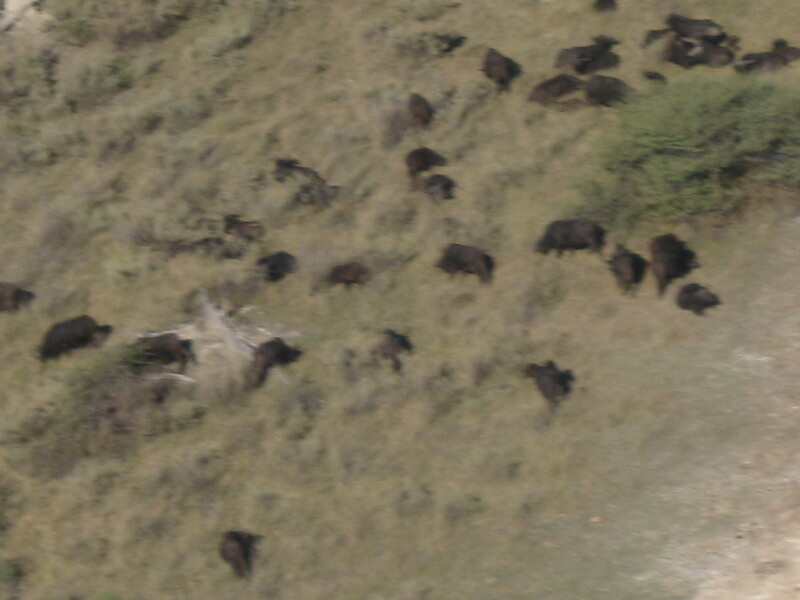 They’re kind of hard to spot too, just poke their heads up on occasion before disappearing below again. Now our guide isn’t crazy, so this picture was taken from the reedy edge of a hippo pool on our sunset mkoro ride, and Linda and I were perfectly happy to sit on the edge where we could see the bottom. Some of our other tourist friends apparently did not get the memo of “the game is Hungry Hungry Hippos for a reason” and kept complaining about how they wanted to go closer, wanted to see the hippo charge or somethin’… Their polers flat-out said they were too scared to go closer while Linda and I stared in mild amazement. If you’re going to come to nature you’d better show some respect, as if you want a perfect shot you can go to the zoo instead! Our poler and guide Kapinga, the man we de facto entrusted our lives to. 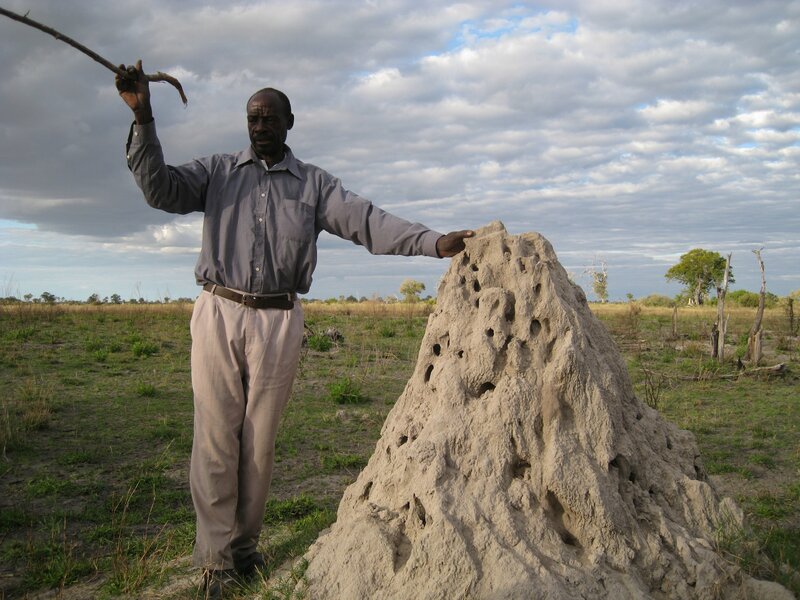 He was also awesome and knew everything about the bush you could imagine, such as an explanation here about how termite mounds have built-in air conditioning. At the end Linda and I gave him an extra 20 pula tip (about US$3, the amount each person was advised to tip the group of polers) and I never saw anyone so happy with such a small amount. 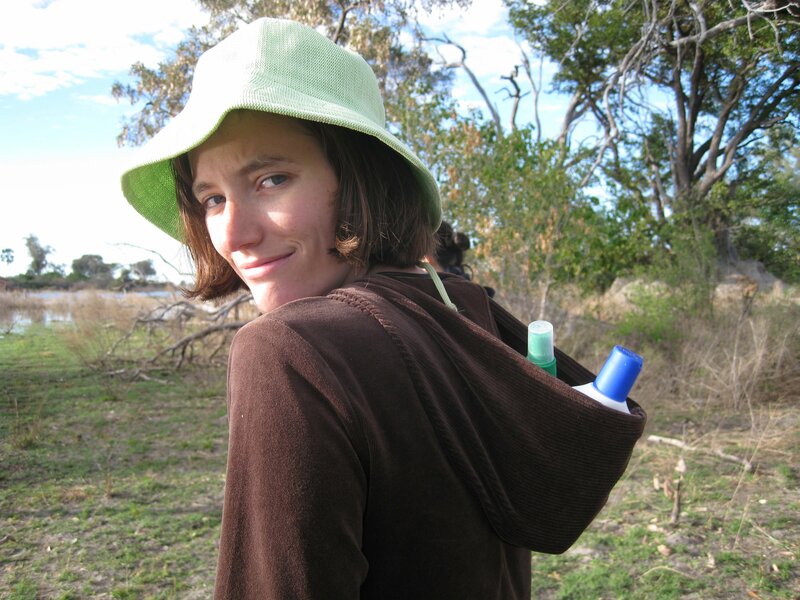 How the cool kids gear up for an Okavango Delta safari, or at least the kids who have an older sister who don’t want to carry the sunscreen and bug spray. Posted from the semi-real world of South Africa- hello everyone! For those who may have not heard before, it turns out it’s hard to travel around the interior of Africa on your own in a way that doesn’t exist in other countries. Infrastructure is nil, public transport can be dodgy and not go where you want to go anyway, and I hope you’re a mechanic if you’re driving alone because if something breaks down you’re the one to fix it. So what is a young and/or crazy pair of lasses going to do? 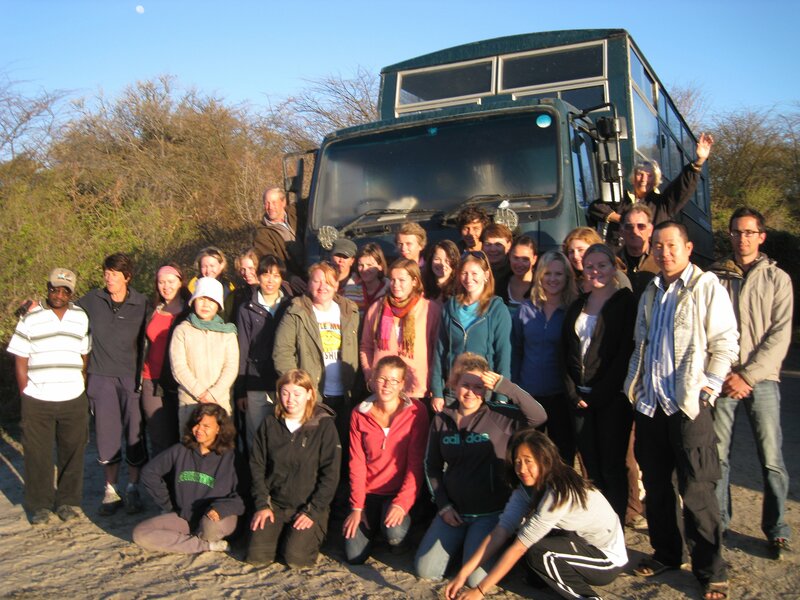 Join an overland safari, of course! Anyway, one of the first things about overlanding you need to get used to is how you wake up really, really early every day because odds are you need to drive several hours (covering several hundred kilometers doesn’t go fast, plus odds are it’s a dirt road). 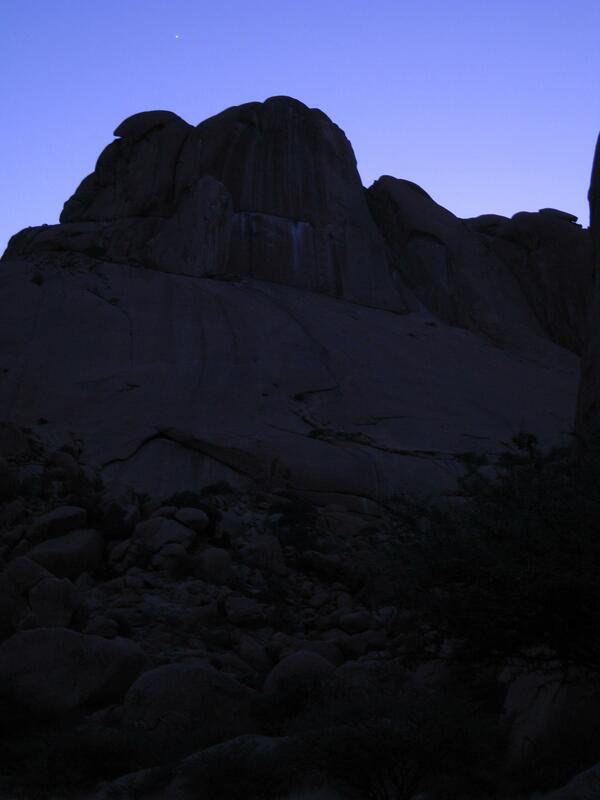 I’m not particularly a morning person, so to make myself feel better I took a picture of brilliantly bright Venus in the pre-dawn sky, this particular picture over Spitzkoppe Mountain in Namibia. And then you drive for a bit. The most random detail about our driving routine was how thoroughly obsessed everyone became with gossip magazines and the like- I can’t say I ever read a Cosmo or People all the way through, but I surely can’t say that anymore! The fact that our group was heavily skewed in the female direction surely didn’t hurt. 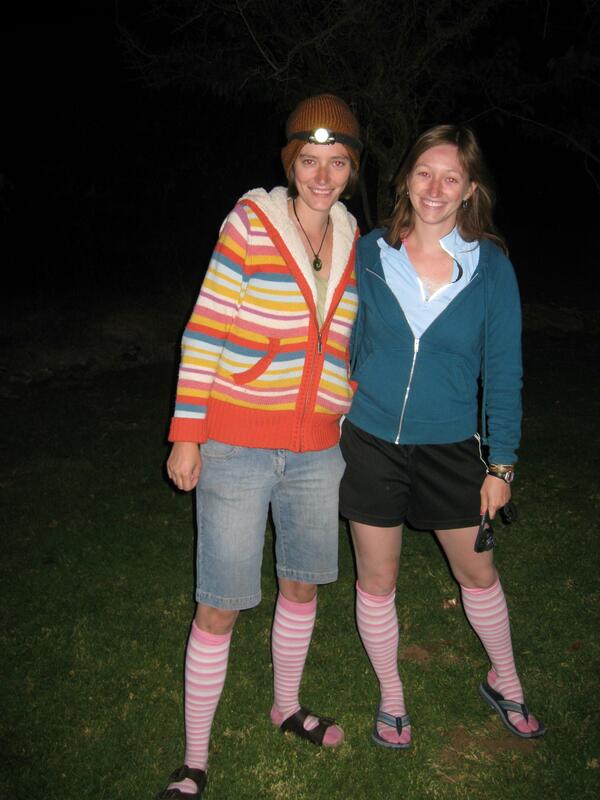 Another pre-dawn picture, arguably looking the most tramp-like I ever have been. I know, I can’t believe there was a time when I’d get dolled up either! To explain the picture, it is awfully cold early in the morning as it’s currently wintertime (we had frost on the tent one morning in the desert), but it can heat up quite a bit by the middle of the day. Solution? Invest in knee-highs. Best socks ever! Speaking of tents, we slept in one almost nonstop for the past three weeks. Not to say camping isn’t fun, but beds still excite me. Laundry can be done about once a week, but you need to hand-wash bras throughout Africa yourself. Turns out they’re an extremely rare commodity in this part of the world so they’ll get stolen off the line or just plain go missing. And of course because this is camping everyone has to help out with something or another, the daily roster going between food prep and washup and the like. Everyone has to help out with “flapping” at the end of a meal though- it’s unsanitary to dry things with dish towels, so everything has to be air-dried by flapping your arms. Towards the end of the day it’s also a convenient excuse to warm yourself by the fire as well.